Choose berries that are large and of similar shape. Place berries in a pre-baked pie crust and pour a strawberry gelatin glaze evenly over the top. Chill until set and serve with a bowl of freshly whipped cream." This pie is the perfect end to a hot summer evening! A must try! 1. In a saucepan, mix together the sugar and corn starch; make sure to blend corn starch in completely. Add boiling water, and cook over medium heat until mixture thickens. Remove from heat. Add gelatin mix, and stir until smooth. Let mixture cool to room temperature. 2. 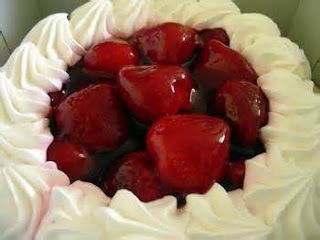 Place strawberries in baked pie shells; position berries with points facing up. Pour cooled gel mixture over strawberries.